A drone, equipped with a camera used by police for surveillance tasks, flies in front of Poniente beach at the eastern costal town of Benidorm, Spain, Aug.18, 2016. Spanish police have started using drones to help patrol some of the country's most popular beaches at a time when tourist arrivals are reaching record highs. Police in Benidorm, on Spain's eastern coast, rolled out the technology in July this year, using the in-built camera on the light unmanned aircraft to detect swimmers in trouble or boats that may need help. They said the drone - first used in Benidorm though other resorts are now launching the aerial surveillance tool - had let them quickly verify situations flagged up by the public. "We have two purposes for the drone: preventative surveillance, where we fly it four times a day, and on-the-spot surveillance where if there's a problem we will fly it to check it out," says Carlos Lopez, the police chief in charge of the forces working on Benidorm's beach. Local police officer Agustin Mirete controls a drone equipped with a camera used for surveillance tasks in the Poniente beach at the eastern costal town of Benidorm, Spain, Aug. 18, 2016. With Europe on security alert after a spate of Islamist attacks over the past 18 months, Lopez said drones could also be used in security and surveillance efforts to prevent such violence, but were not specifically introduced for that purpose. The number of foreign tourists arriving in Spain rose nearly 12 percent in the first six months of the year over the same period in 2015 as militant violence in other Mediterranean venues like the Middle East and Turkey knocked bookings there. Drones have already been used by authorities elsewhere too as a means of ensuring bather safety, including in areas known for shark attacks in the United States. Most situations that would prompt drone use in Spain have so far turned out to be false alarms. After a lifejacket was seen floating in the sea, police sent out the drone to ascertain whether it was a sign of trouble. "It had just come from some swimmers in a nearby cove," said Lopez. Benidorm's five kilometers (three miles) of sandy beach are particularly popular with foreign tourists, including Britons. Spain has reinforced security in areas frequented by visitors this summer, with just over 42,600 police officers posted to areas of high tourism, a 14 percent increase on 2015. 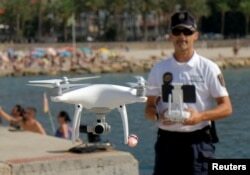 In Benidorm, four trained police officers operate the drone. The aircraft surveillance has its limits, however - it can fly for only about 20 minutes at a time, after which it needs to be recharged for up to an hour.